After two years of dormancy, Italy's Mount Etna put on a spectacular show Thursday morning. An hourlong eruption began around 3:20 a.m. local time, sending a lava fountain more than 3,000 feet into the air and coating nearby villages in a layer of ash. Although the eruption forced the closure of the nearby Reggio Calabria airport, there were no reports of damage or injury. 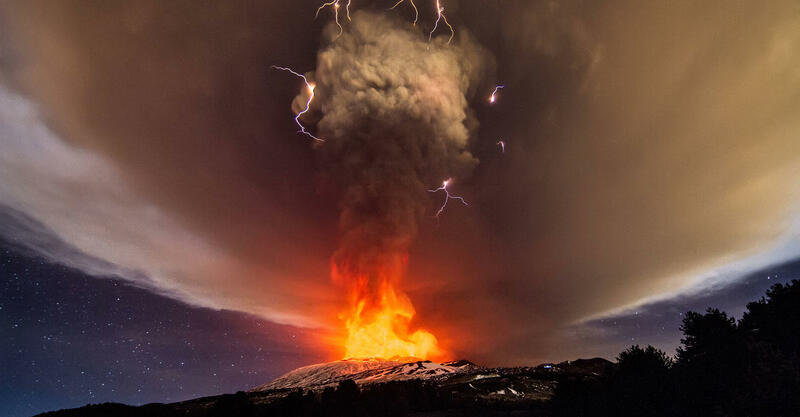 The eruption also produced a breathtaking phenomenon known as a "dirty thunderstorm," which occurs when lightning appears in the sky directly above an erupting volcano. Scientists believe the dramatic lighting that accompanies certain eruptions is the result of positively charged particles that are ejected from the volcano. A second type of volcanic lighting has been observed to form downwind of the ash plume, but that "plume lighting" is not well-understood. Click here to learn more about volcanic lightning. According to EarthSky, the thick clouds of ash produced during an eruption make it challenging to study the striking phenomenon, but recent advances in radio wave technology are helping scientists observe lightning storms that would otherwise be cloaked in ash. Towering 10,922 feet over Sicily's eastern coast, Mount Etna is the tallest active volcano in continental Europe. A series of four nested stratovolcanoes whose activity date back to 1500 BC, the mountain has been designated as a UNESCO World Heritage Site by the United Nations.